The Best Pharma Patent blogs from thousands of top Pharma blogs in our index using search and social metrics. Data will be refreshed once a week. Pharma Patent newsletter is a comprehensive summary of the day's most important blog posts and news articles from the best Pharma Patent websites on the web, and delivered to your email inbox each morning. To subscribe, simply provide us with your email address. Worldwide About Blog Intellectual Property and Patent news in the Chemical, Biotech, and Pharmaceutical industries. Facebook fans 1,361. Twitter followers 871. Facebook fans 83. Twitter followers 16,719. Facebook fans 210. Twitter followers 1,349. About Blog Pharma in Brief is written by Norton Rose Fulbright litigation and regulatory lawyers covering topics such as patent and class action disputes, drug advertising & reimbursement, and compliance with Health Canada’s governing laws and guidelines. Facebook fans 3,619. Twitter followers 14,839. Leesburg, VA About Blog Find updates on Pharma Patent from IPWatchdog.com. Facebook fans 4,211. Twitter followers 13,517. Global About Blog Stay up to date on case law and developments in IP Law on the pharma industry via Kluwer Patent Blog. Facebook fans 22,054. Twitter followers 12,087. About Blog BioLoquitur is a legal publication which offers analysis and commentary regarding a wide variety of intellectual property issues impacting Life Science firms. About Blog A niche blog dedicated to 'Drug Patent Litigation' decisions from all over the world. About Blog Woodfield Pharmaceutical, LLC maintains an established record of commercialization success as a proven CMO partner. As a leading pharmaceutical contract manufacturer, they provide a range of services and delivery methods that are led by seasoned professionals. About Blog Herbert Smith Freehills – providing legal insight with a global perspective. Facebook fans n/a. Twitter followers 9,240. About Blog Innovators in life sciences, BioPharma Law Group’s team of professionals has the industry knowledge and in-house experience to identify critical issues and provide strategic solutions that address the client’s legal and business needs. 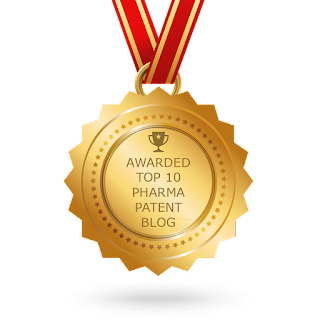 CONGRATULATIONS to every blogger that has made this Top Pharma Patent Blogs list! This is the most comprehensive list of best Pharma Patent blogs on the internet and I’m honoured to have you as part of this! I personally give you a high-five and want to thank you for your contribution to this world.